The Cunard liners are arguably the most famous Ocean liners in the world and have been serving their passengers for over a century and a half. 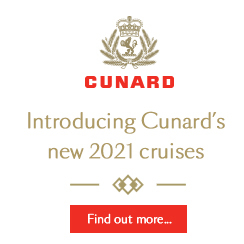 Cunard are renowned for their legendary ‘White Star Service’ which guarantees you the highest level of service from its entire crew. You’ll always be greeted by smart, polite and knowledgeable crew, ready and waiting to service your every need. Facilities on board Cunard ships include luxury spas, grand ballrooms, deck sports, theatres and casinos. Each stateroom on board a Cunard vessel has a personal steward who can provide 24 hour rooms service; interactive TV, telephone, fridge, bathrobe and slippers, daily newspaper and 220v British 3-pin sockets. Princess Grill Suites also come with concierge service and Queens Grill Suites can enjoy a butler service from Cunard. Cunard offers the highest standards of fine dining to its passengers. Each Cunard ship has menus created by some of the worlds top chefs which you will enjoy inside the most elegant restaurants. Traditional Afternoon Tea is Cunard's speciality dish. Served by white-gloved waiters you can enjoy fresh scones, cucumber sandwiches and tea whilst listening to a string quartet inside the Queens Ballroom. The 'Queens Grill' and 'Princess Grill' are the height of formal dining on board all three Cunard ships. Speciality and alternative restaurants are also available on each Cunard ship including 'The Verandah' on Queen Elizabeth, serving French cuisine, The 'Britannia' on the Queen Victoria and Todd English's restaurant on board the Queen Mary 2. Each Cunard ship features a range of bars and lounges for you to relax and enjoy from champagne bars to traditional English pubs. Queen Mary 2 features a planetarium, the only planetarium at sea. Boutique shops are a feature on all Cunard ships where you will find fine jewellery, books, designer clothes, gifts and souvenirs. There are also galleries for you to browse and enjoy including fine art and photography. Cunard also has a strong enrichment programme which involves guest speakers, workshops as varied as acting, computer lessons, painting and fitness classes. If you wish to stay fit and active whilst onboard Cunard has a wide programme of deck sports available as well as a golf simulator, swimming pools and a gymnasium. In the evenings Cunard ships come alive with dramatic theatrical performances, music and pub entertainment. Or you can dance the night away in one of Cunard’s spectacular ballrooms. Cunard provide a range of children’s activities and services on board their ships so families can make the most of their trip. The Play Zone is available for children aged 2 – 7 years and the team of fully qualified staff are always on hand to watch over your little one. There are plenty of arts and crafts activities, books, puzzles and computer games for kids to enjoy. The Kids Zone is fully supervised by qualified Cunard staff who organise sports competitions, scavenger hunts and much more to keep your 8 – 12 year olds busy. There are also arts and crafts activities and plenty of games consoles for them to enjoy too. The Teen Zone is designed for 13 – 17 year olds and hosts activities such as team tournaments, table tennis matches, discos, quizzes and much more into the evening. Pre-book your shore excursions with Cunard before you set sail online and you won’t be disappointed. Some Cunard excursion highlights include: The Great Pyramids and the Sphinx, A gondola tour of Venice and Zip-lining in St Lucia. Cunard’s flagship, the Queen Mary 2 is one of the largest ships ever built. Traditionally British in style she frequently undertakes transatlantic crossings between Southampton and New York. Know for her elegance and graceful splendour, Queen Victoria offers a classic cruising experience, with Cunard's signature blend of high standards and sophistication.